Yesterday I took part in a panel discussion at the Hawkwell Theatre in Sligo, chaired by Geraldine Duignan with John Molyneaux and Nichola MacEvilly, discussing the legacy of John Berger. I read and thought about Berger’s work a lot in the run up to the event, so, in the Berger-esque spirit of sharing here are some of my notes. I first became aware of Berger because of the Berger vs Patrick Heron argument that rumbled on through the 50s. The argument boiled down to Responsibility vs Freedom; whether artists had a responsibility to society or whether they should be able to make what their work in a state of complete freedom. 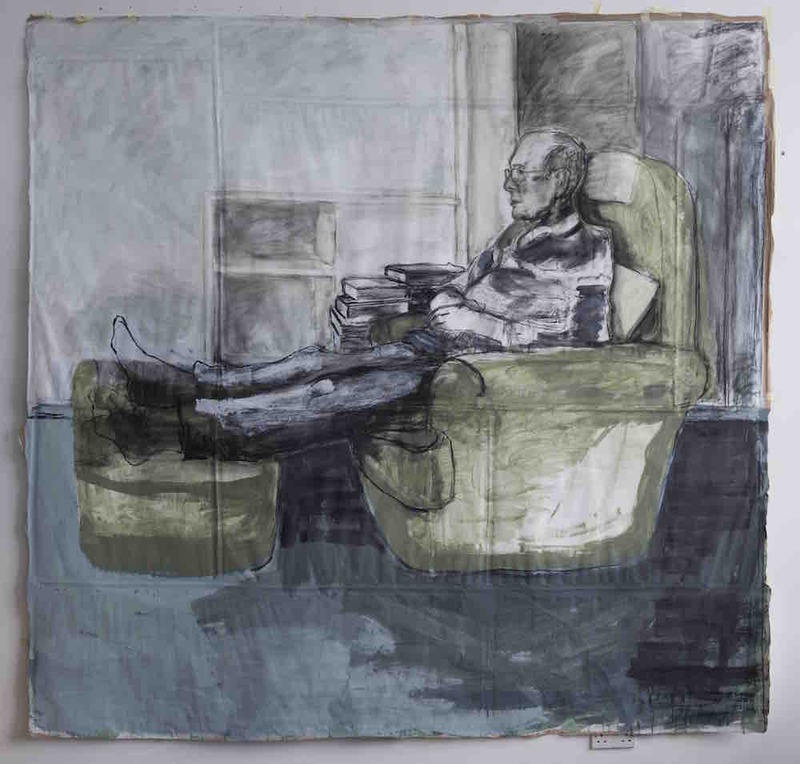 I went on to write my thesis about Realism in Britain in the 1950s and 1960s, looking at a number of the artists Berger had helped bring to the public’s attention with the show Looking Forward in 1952. I began working from direct observation about 10 years ago. I wanted to make work that was wasn’t about the language of art, but instead was about my direct experience of life. Beginning this new chapter in my work made me think about representation, and in this context Berger’s writing has become more and more relevant to me. In his writing he often describes the act of drawing an everyday object or scene at home, or trying to capture a likeness in a portrait. In the context of a lot of critically engaged contemporary art practice these activities might seem hopelessly old fashioned, anachronistic. I am interested in Berger because his work shares my own preoccupations, namely, an engagement with and fascination for the art of the past, and, a desire to convey the sorrow, joy, simplicity and complexity of life as it is lived. His strength as an art critic is identifying and sharing his love for artists whose work has profound sense of humanity. So he looks at people like Frans Hals and Rembrandt. These two artists both speak about human experience at the start of what we might call the capitalist period, in a place and time which was not unlike the neo-liberal world of today. 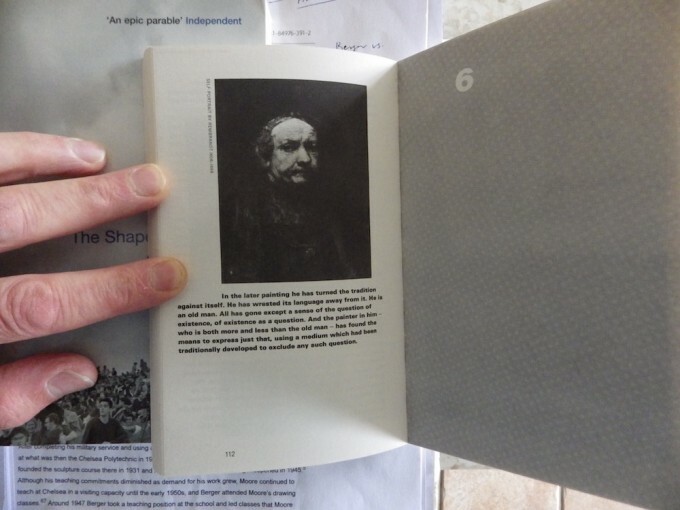 A key text for me is the chapter on Rembrandt from Shape of a Pocket*, entitled ‘Rembrandt and the Body’. Berger talks about the way the pictures have been painted; about the way that component parts of the figure are painted almost independently of one another. These component parts function in a manner quite unlike conventional figure painting, they come out from the painting, as fragments, but wholly convincing ones. The inconsistencies in proportion that come hand in hand with this way of working come from the series of intense observations the artist has made of the person before him, and add rather than detract from the work. ‘When he painted freely those he loved or imagined or felt close to, he tried to enter their corporeal space as it existed at that precise moment, he tried to enter their Hotel-Dieu. And so to find an exit from the darkness. These observations are typical of Berger and typical of the kind of work that Berger writes about because they embody and unfiltered human emotion and empathy. They come directly from life as it is lived. This is spelt out, in black and white, in Chapter 5 of Ways of Seeing**. At the end of a chapter where Berger has mounted a blistering critique of the complicity of painting in perpetuating inequality over centuries, he points us to a late self-portrait by Rembrandt. Reminding us that within the canon there are artists who have made profoundly different works, which present life as it is, unfiltered, terrifying and beautiful. *The Shape of a Pocket, Bloomsbury, 2001.